Possibly the most obscure of the MCU movies to date, Ant-Man features Paul Rudd as Scott Lang, a thief who is released from prison and who seeks to reform his ways and live an honest future. His reputation precedes him and leaves him without work, forcing him to return to his thieving ways when a new opportunity arises; but the heist is a failure and leaves him with naught but a strange suit that allows him to change his size, and when he discovers his true origins, he becomes tangled in a large scale conflict to keep it from those who seek to abuse its power. It surely wasn't easy to market one of Marvel's most obscure heroes, and one whose name sounds utterly ridiculous to those unfamiliar with his comic book outings. 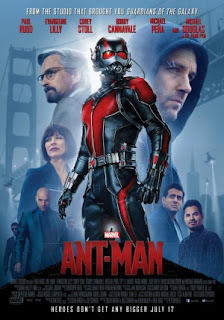 But, thankfully, Ant-Man transcends it's initially stupid premise with a stylistic portrayal - the size shifting ability of our titular hero makes way for some excellent fight scenes, balancing humour and fast paced action in an almost flawless manner. This compensates for several of it's flaws, which includes some bland supporting characters and some annoying sidekicks. Paul Rudd is a charming lead to what is in general a lineup of fine performances, with Corey Stoll as Darren Cross also standing out as an intimidating (if sometimes bland) antagonist. In general, Ant-Man also focuses on it's own narrative and never exploits the shared universe it now dwells within - and so we never feel like we're enduring another commercial for the rest of the franchise with a new hero thrown in. It's got fast paced action, a great cast, and a charming sense of humour, forming a likeable if imperfect superhero flick.